Ford & Ulrich is a woman-owned business with 45 years of experience in servicing the needs of our customers. Originally started as a production tool and mill supply house, Ford & Ulrich has evolved into a material handling solutions provider. Although we still carry many mill supply products today, our focus is on material handling equipment. Our layout and design capabilities have afforded us great success in providing storage solutions for customers throughout New England. Whether we are laying-out shelving or a pallet rack for a storeroom or providing a customized locker room design, we work closely with our customers to fulfill their storage needs. In addition to our design and layout services, we also support our customers’ efforts to provide a safe and productive workplace. We offer both standard and customized material handling equipment to help our customers solve both material handling and ergonomic application issues. Site visits by the professionals and Ford & Ulrich make it possible to recommend equipment ideally suited to increase productivity, increase workplace safety, lower worker compensation costs, and aid in reducing the overall cost to manufacture a product. Ford & Ulrich can not only provide you with the equipment necessary for solving your material handling application, but our professional installation crew will assemble or install anywhere in New England. 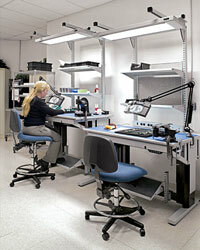 As a distributor for over 1,000 manufacturers, Ford & Ulrich can supply virtually any equipment used for the storage and movement of products, including: lift tables; conveyors; rack and shelving; mezzanines and modular offices; high speed doors; and safety and ergonomic/productivity enhancing products, as well as many affiliated items. A diverse product line, knowledgeable personnel, and an emphasis on safety combine to make Ford & Ulrich a recognized leader in the material handling industry. Ford & Ulrich provides customers in a wide range of industries with solutions to move, lift, and store their parts and products. Ford & Ulrich is your one-stop, full-service provider for all of your material handling needs.